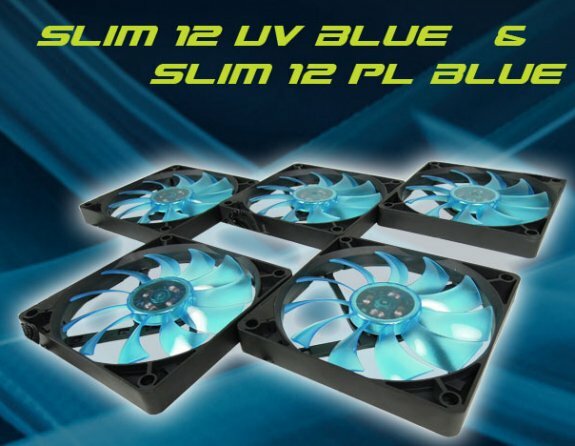 GELID introduces two new slim-line 120mm fans: the Slim 12 UV Blue and the Slim 12 PL Blue. The UV Blue model has an UV reactive blue impeler and a fixed RPM of 1500, while the PL Blue edition has four blue LEDs and PWM control with a RPM range of 900 to 1600RPM. Engineers at GELID Solutions go slim and have created two slim profile fans (120x120x15.8mm) with surprisingly high cooling performance. The “Slim 12 UV Blue” fan comes with an UV reactive blue impeller and has a fixed rpm speed of 1500. The “Slim 12 PL Blue” also comes with a blue impeller but includes a high-quality PWM control for a rpm range of 900-1600. Additionally the “Slim 12 PL Blue” includes 4 blue LED lights and an on/off switch mounted on the frame of the fan. Although both fans generate high air flow, they are very silent. The “Slim 12 UV Blue” has a start voltage of only 5 volts and 7 volts for “Slim 12 PL Blue” to start. The “Slim 12 UV Blue” has a 5-year supplier warranty and because of the LED lights the “Slim 12 PL Blue” has a 3-year warranty. Both fans are RoHS and WEEE conform. “The trend is to go slim. We have tried to combine slim design with high performance and we have achieved more than we have expected”, said VC Tran, Marketing Director of GELID Solutions Ltd. Both fans are available now for a MSRP of USD 8.60 /6.60 Euro (Slim 12 UV Blue) and USD 12.85 / EUR 9.90 (Slim 12 PL Blue).